My daily 15 minute drive to work takes me through farmland, wooded areas, open fields, and city streets. Horses graze, deer leap across the road, and chickens around wander yards. The “big” city is only about 30 minutes away where we can shop, eat at amazing restaurants, check out museums, and all sort of other fun things. There are times that I wished that I lived in the city. I love the hustle and bustle, I love all the excitement, and I love all of the opportunities that are available to everyone that is there. Of course the country and smaller towns have a lot to offer too. Wide open spaces, safety, a sense of community, and where I live great schools. 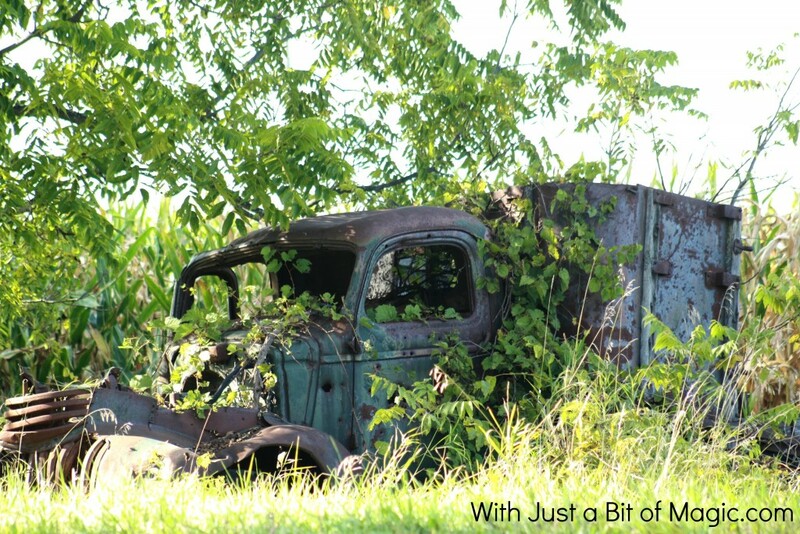 As I drive around there are a few sights that have grabbed my attention and begged to be photographed. 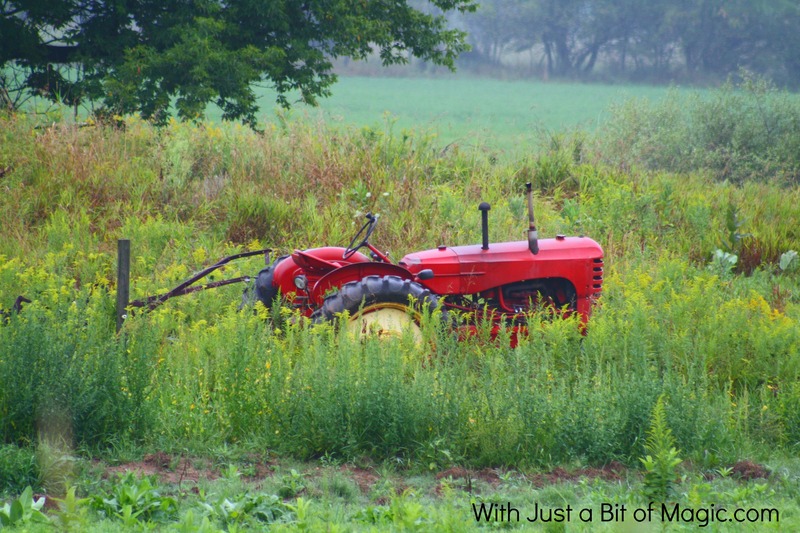 This red tractor had been sitting in this field for weeks. I don’t know if it was broken down or not… but with the surrounding fields, beautiful trees, and fog the morning I drove by it looked perfect sitting there, like it had been taken from another time and place and just dropped there. 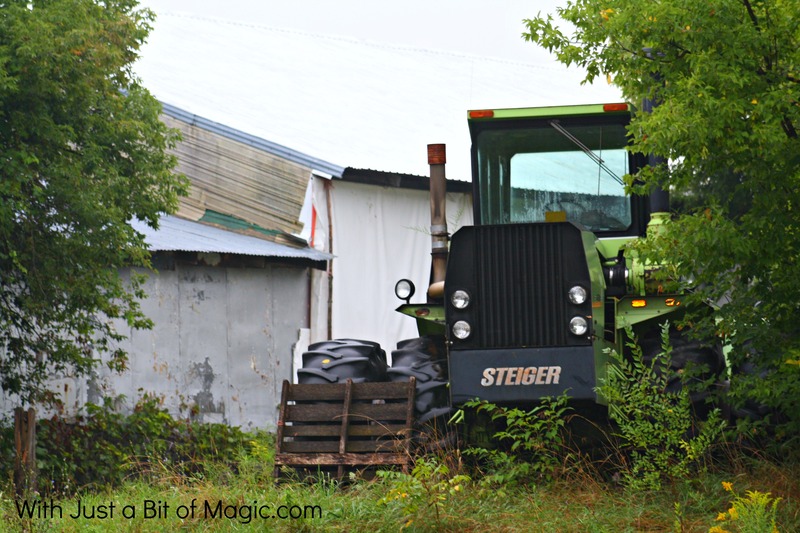 This green tractor never moves from this spot and each day that I see it I am reminded of the movie Cars. It looks just like one of the tractors that Mater & Lightening tip when they go tractor tipping in the field for fun. This one is my absolute favorite. There is a long story behind this one and my husbands grandmother told me about it but of course I can’t remember it. What I do remember is that this truck was parked in it’s current spot close to 50 years ago and hasn’t moved since. 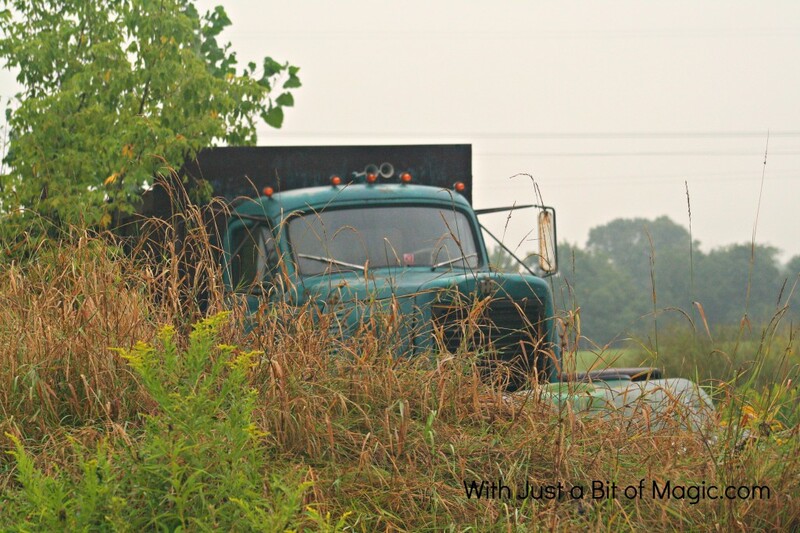 The land owners and I think family of the truck have never considered moving it and so there it remains with the windows missing, surrounded by weeds, and little trees growing out of the engine area. I’ve been thinking more and more about where I live and the sights in my area and have had some great ideas on what to go in search of next. Barns! When you live in Michigan there is a ton of farms and with that comes some beautiful and old barns. I think a little research first might be in order so I’m not driving around aimlessly looking for cool barns. 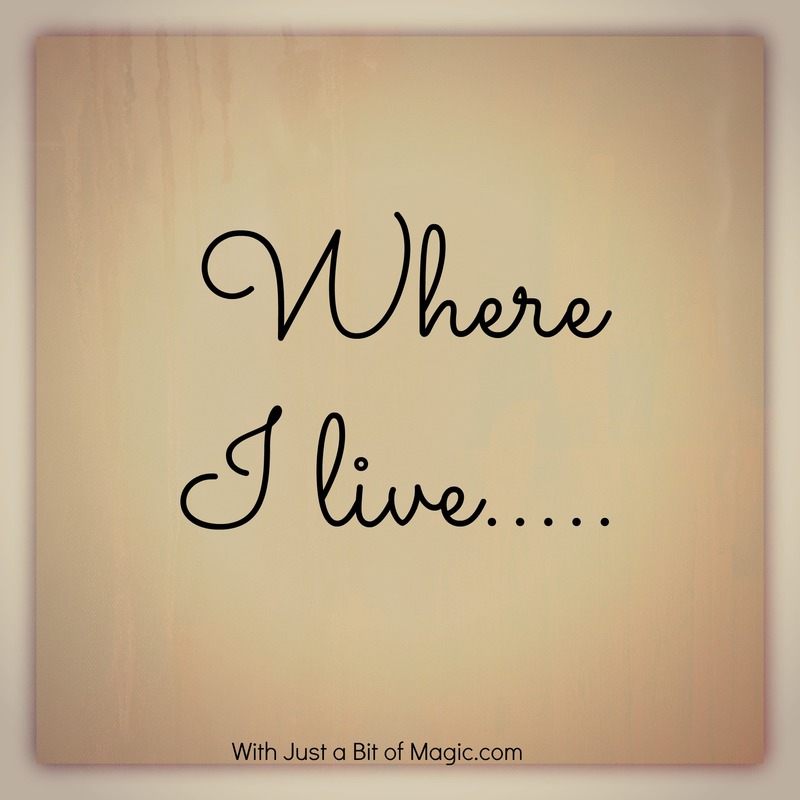 Tell me about where you live…. For us it’s the unofficial start of summer. School is out and it’s the first weekend that the kids can stay up late, ride all the rides they want, eat all the treats they can handle, hang out with friends, and enjoy the fun. For me, and other parents, it’s a time to watch our kids march in the parades. A time to be so proud of how talented they are and incredible they are. 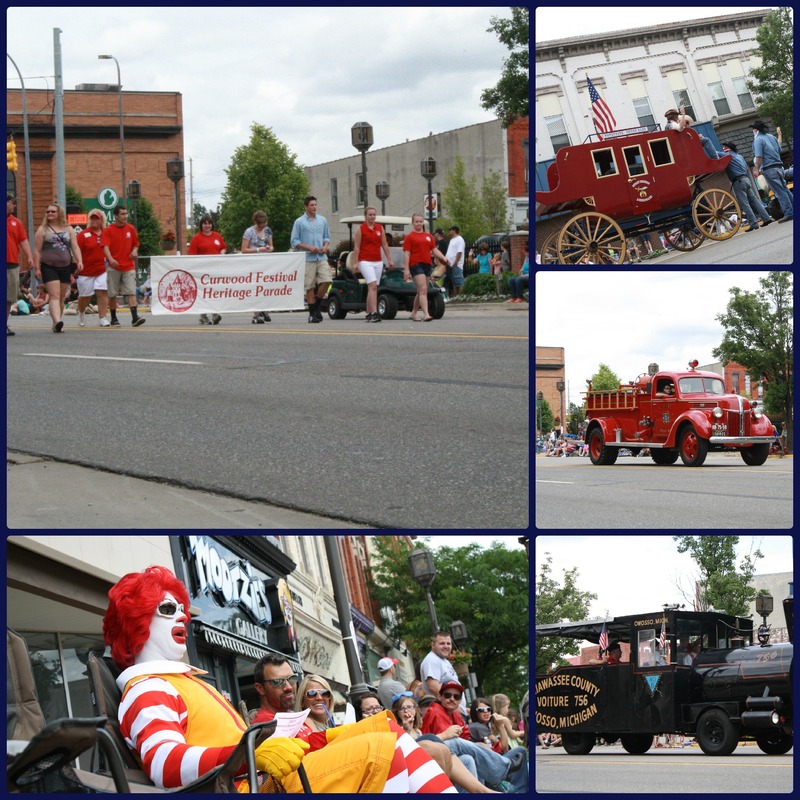 Floats, bands, Ronald McDonald, and old west gun fights are all part of the parade. 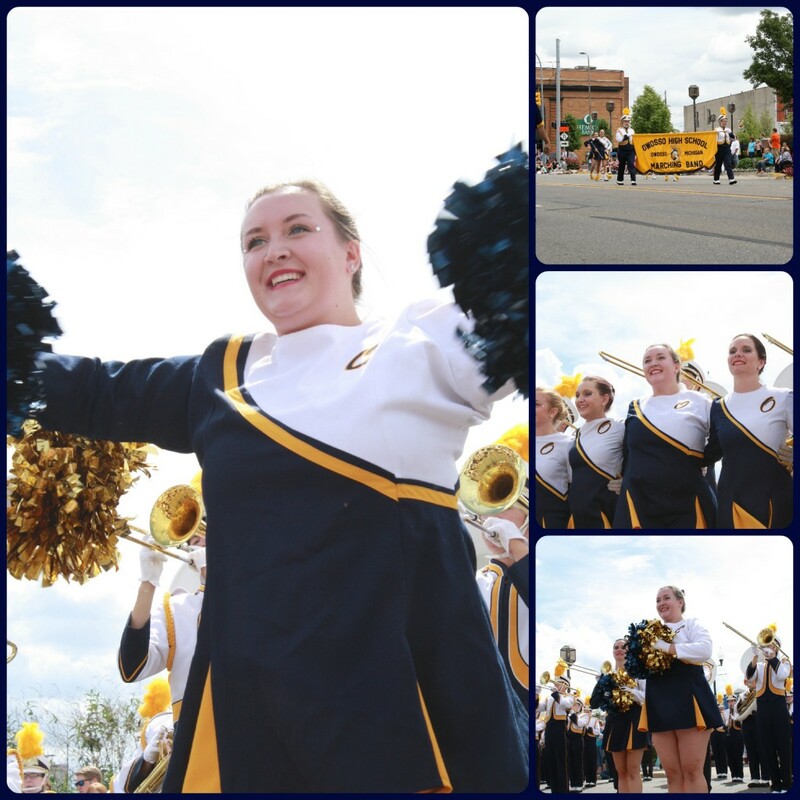 This year all three of my girls were in the parades during Curwood. 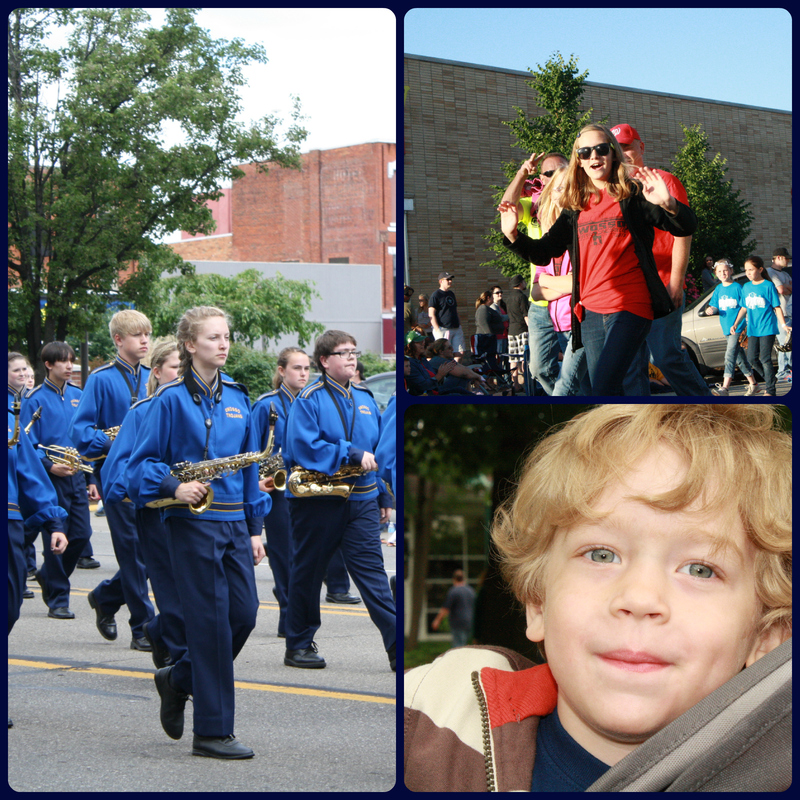 Lauren marched in the kids parade on Friday evening while Natalie and Caitlin marched in the Heritage parade on Saturday afternoon. All the while Andrew looked on waiting as patiently as a 3 year old could to see his sisters. There is no doubt in my mind that they heard him yelling their names as they marched by. One of the highlights of the day (aside from getting an elephant ear from my favorite stand) is the performance that the high school marching band puts on after the parade. It’s the last performance that the seniors take part in… this event happens after they’ve graduated too! They all come back to perform and to me that shows pride and dedication to the band that they put so much time and effort into over the past 4 years. This year my daughter is front and center as one of the TMB majorettes and I made sure that I was in place early so I could be “that mom” to get the perfect pictures of her performing. 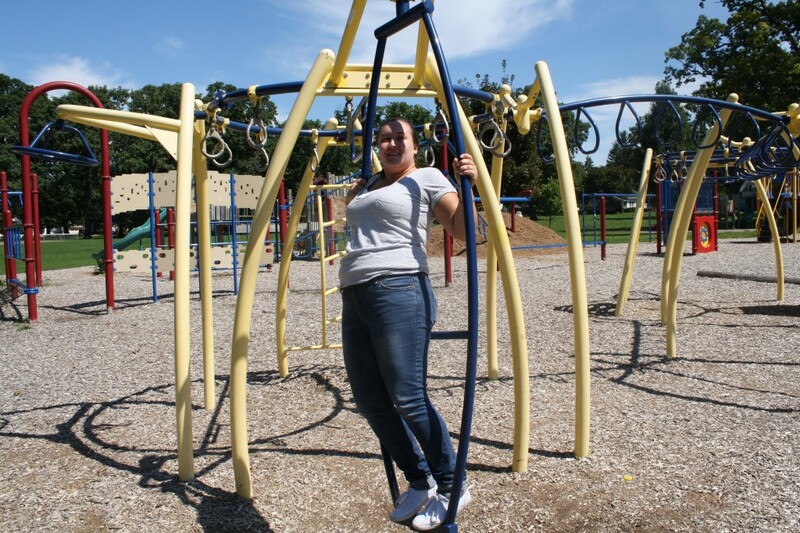 It’s been a while since I linked up with Angie from Seven Clown Circus and Amanda from Dude Mom for Wordful Wednesday so that’s what I’m doing today and because I had some great pictures to share with all of you. I’ll be the first to admit that I am not a big fan of winter. I hate being cold and wet and once I get a chill it’s sometimes hard to get warm for a while. For some reason though this does not seem to affect kids and I have no idea why. 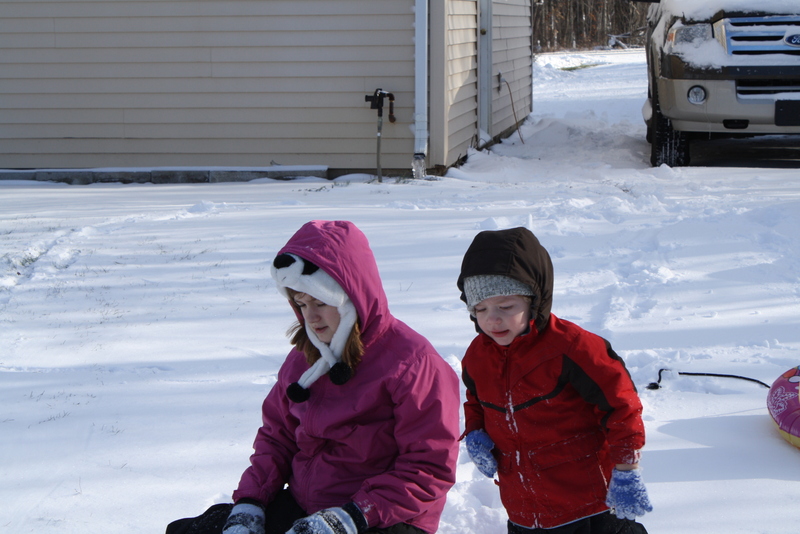 They’re willing to get all bundled up and head outside to play in the snow all day long. It won’t matter that their gloves are caked with snow or that their faces are red and noses runny because they’re having fun making snow angels. They build snowmen, toss snow balls back and forth at one another, and get along for more time than they normally do when they’re inside. 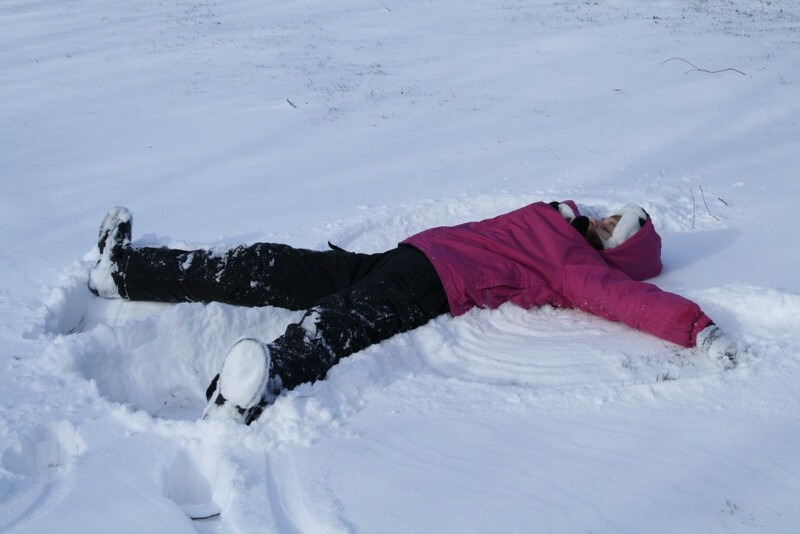 Michigan is a winter wonderland… sledding, skiing, ice skating, and snowmobiling are just a few of the things that make winter fun… if you like the snow and cold weather that is. Maybe this year I’ll give in and try to find all of the warmest articles of clothing possible and actually go snowmobiling with my husband… of course there will be a compromise though because I want to give snow shoeing a try! Are winter sports your thing? 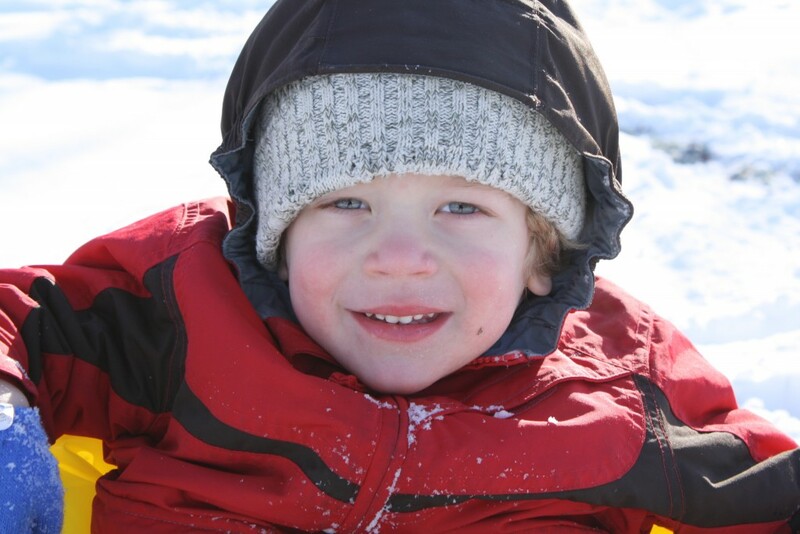 Can you tell me why kids don’t seem to be affected by the cold? Hey… it’s Wednesday so I’m linking this awesome post up with Seven Clown Circus and Parenting by Dummies! Want to know one of my favorite places to eat? Panera. Yup… love it! I think that it’s because it’s a carb lovers dream and there is nothing that I like more than bread. I’m pretty sure that I could make a diet out of bread alone and then I’d spend the time I’m not eating bread at the gym running off all of the calories from it. 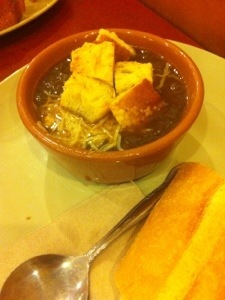 It’s a good thing that the closest Panera is like 30 minutes away from me! For us, my daughter and I, it’s tradition to eat at Panera and then head to our favorite Target store just down the road. Our latest trip was to celebrate her birthday… I know, I know…. it’s not that exciting of a place to celebrate your 17th birthday. But we went out to eat at one of her other favorites the weekend before and I did buy her tickets to see Lady Gaga. So, it’s okay that we had soup & sandwiches on her birthday. 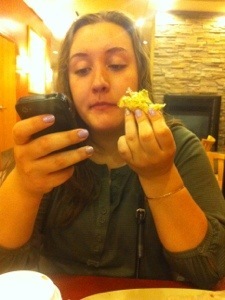 See, she’s fully enjoying her sandwich while using their free wifi! I think she was Tweeting a pic of her dinner… She got that from me! LOL… like mother like daughter! I don’t think that it matters what time of year we go because we always get their soup. It is absolutely amazing! Warm, comforting, and full of fresh veggies. It’s nothing like the canned soups that get at the store or some other restaurants. Normally, I get the black bean soup which is thick & smoky but this time I thought I’d try something new and got their french onion soup. I have to say that it was pretty good but I could have used a bit more cheese…. I mean who doesn’t like melty cheese? Caitlin tried the vegetarian garden vegetable with pesto of course she didn’t offer to let me try it so I’m going to assume that since she ate it all that it had to be pretty good. Our birthday dinner couldn’t be complete without dessert! I mean how could we go to Panera and not try one of those delicious desserts that they have? 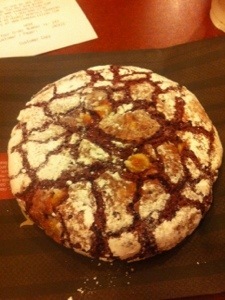 We opted for the red velvet cookies… I knew that I should have gone for that thick, gooey, brownie they had. Red velvet cookies aren’t all that good. It was a good thing that we went shopping after the soup… bread… cookies… We would have fallen asleep driving home after all that food. 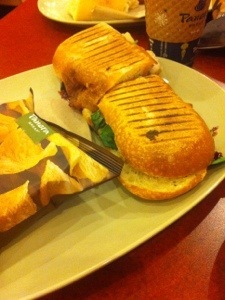 Have you been to Panera lately? What’s your favorite thing there? 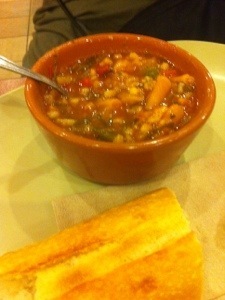 I was provided with a $10 gift card to check out the delicious soups at Panera & a stipend for writing about my experiences from DailyBuzz Food. But all thoughts, opinions, and weight gain from the cookie are mine. This past weekend I took my daughter on a surprise trip and it took everything that I had to keep from telling her too! She spent more than half the trip asking where are we going, when are we going to get there, why did I have to bring this book, are we doing this.. are we doing that.. why can’t you tell me… and so on. Before to long though were had arrived and within minutes she had figured out what we were doing. 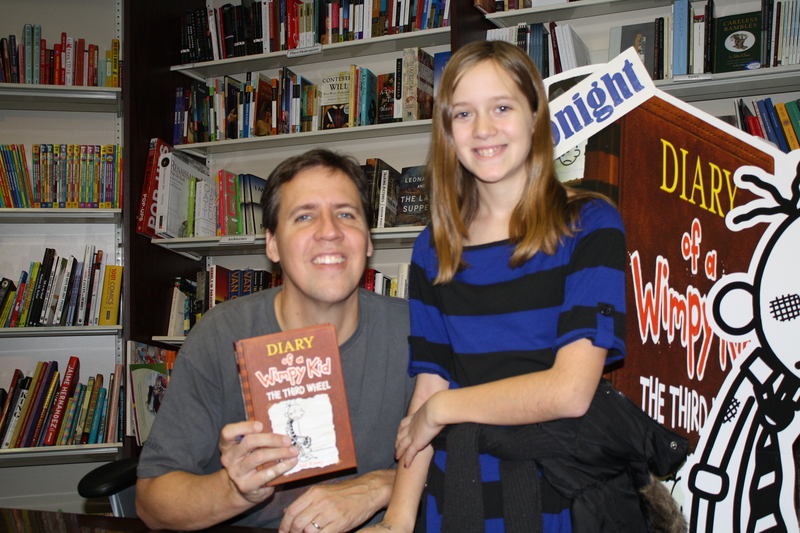 We were meeting the Diary of a Wimpy Kid author Jeff Kinney! To say that she was excited was an understatement. 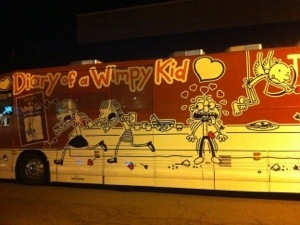 I have to say that I was really impressed with the bus! 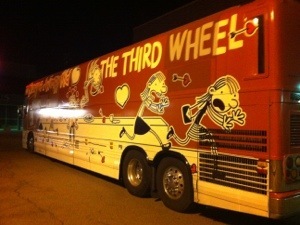 It was covered from front to back and both sides promoting the new Diary of a Wimpy Kid book… the Third Wheel. The event was so much fun for the kids! 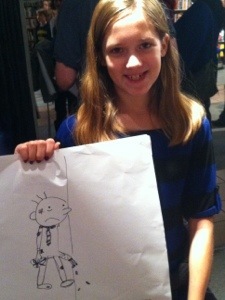 They really went all out and made sure that there was always something to do while waiting their turn to meet Jeff Kinney and get their book signed. 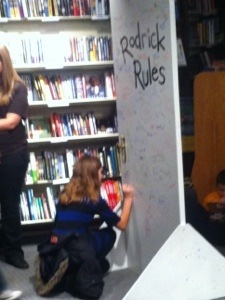 A dj played fun dance music all night while running dance contests, there was a photo booth, a tattoo station, a drawing contest, and of course since it was in a book store there were books & magazine to check out just in case you got really bored! The big event of the night though was getting to talk to Jeff Kinney after all the other kids had left… more on that in another post! 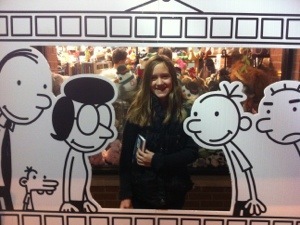 Stay tuned for a review of the new Diary of a Wimpy Kid book The Third Wheel and a great giveaway! 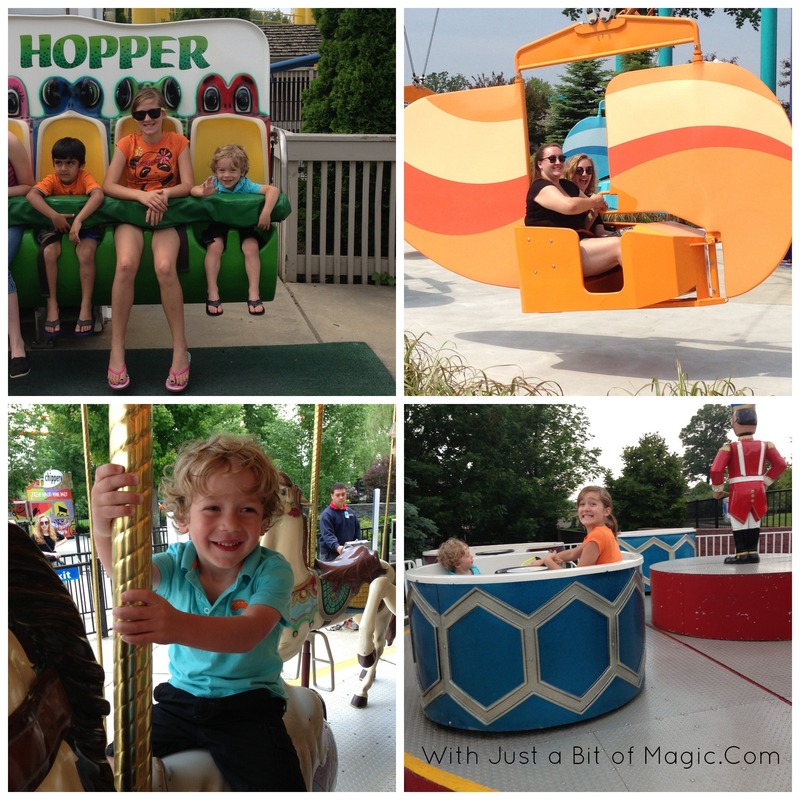 As always since it’s Wednesday I’m linking up with Seven Clown Circus and Parenting by Dummies for Wordful Wednesday! 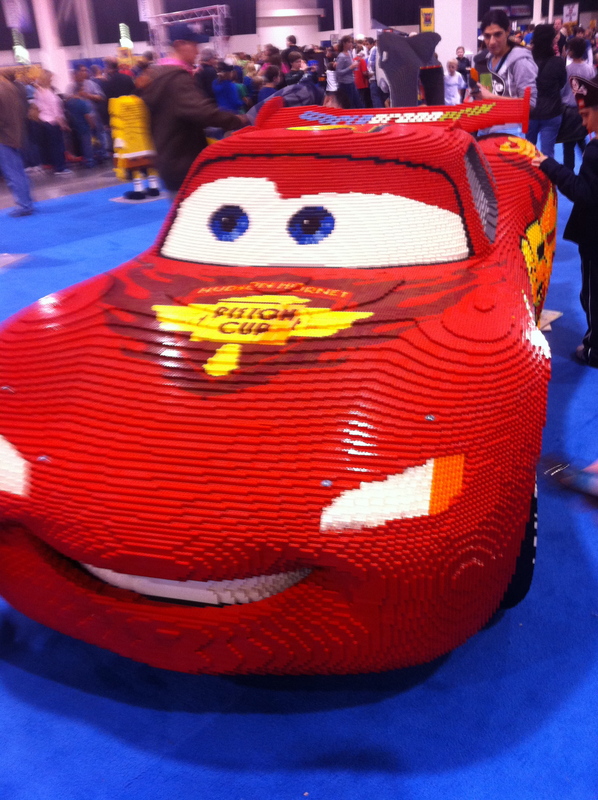 This past weekend we had the opportunity to check out the Lego KidsFest down in Novi. So we packed up the kids, invited my brother in law, sister in law, and their son out for a day of family fun. I’m happy to say that we were not disappointed! It was awesome! 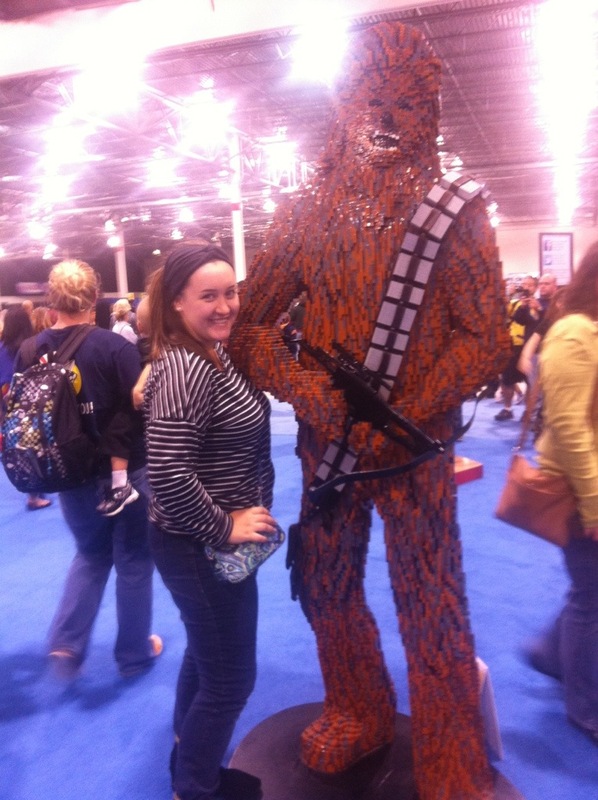 Of course the girls found one of their favorite characters from Star Wars…. Chewy! I really thought that they’d be more excited about the Darth Vader though. 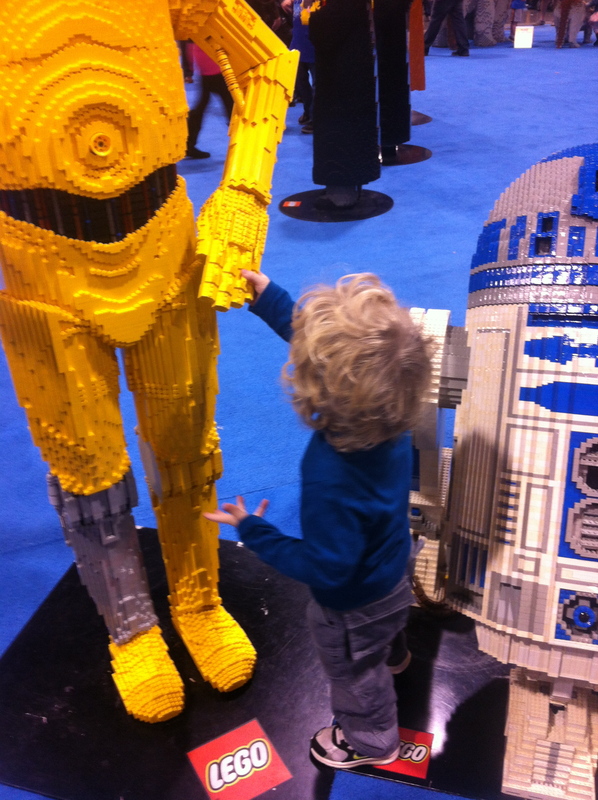 Andrew thought that he had to shake C3PO’s hand… or maybe he was trying to take it apart. I’m not sure because we were busy trying to get him to let go before he broke it. Lightening McQueen was one of my favorite displays at Lego KidsFest. It was awesome! I can’t imagine how many Legos it took to make that not to mention the time involved. I’m thinking that they have to glue those things together just to keep the kids from taking them apart… I didn’t try to take one apart so don’t worry! The kids had a lot of fun building things while we were there. Natalie built a corporate building that landed in Alaska on the map and Andrew… well he just built stuff but he had a lot of fun doing it. More favorite characters! Lauren hanging with her friend Harry and Andrew was helping with Buzz’s lasers! 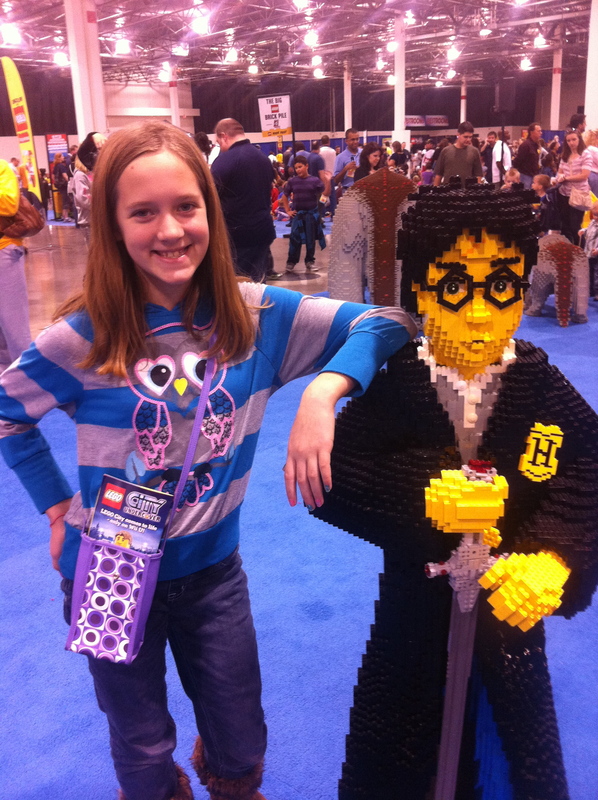 If you have a chance to get tickets to Lego KidsFest in your area go! 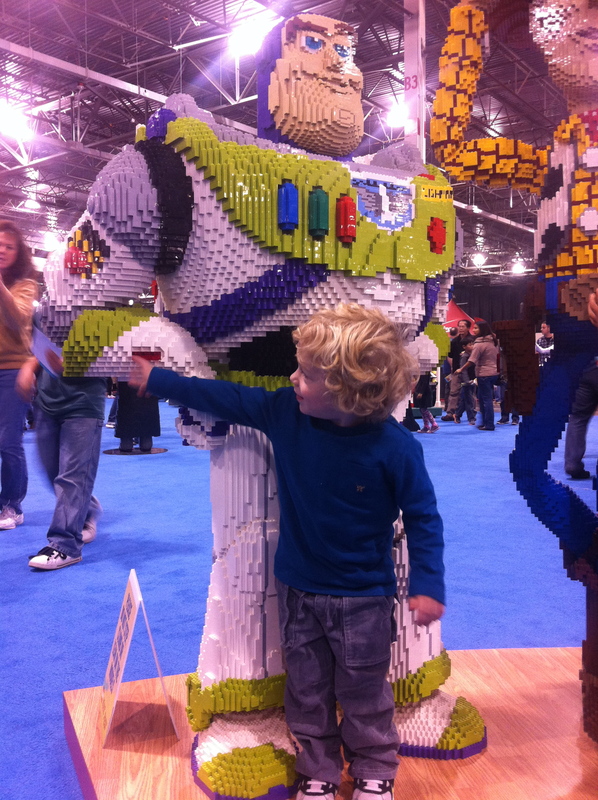 Seriously… this is a great family event no matter hold old your kids are. 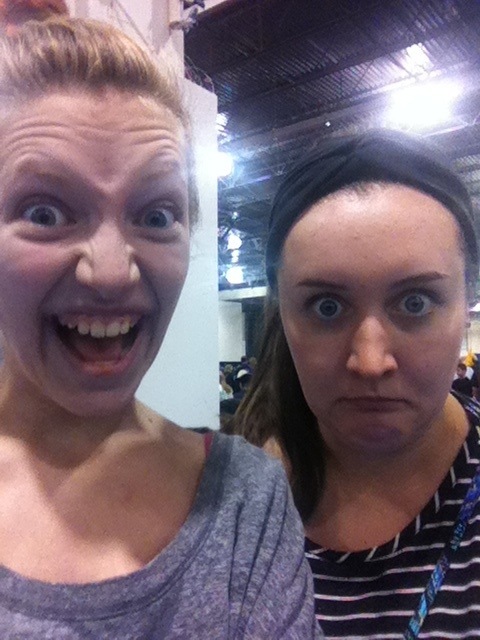 My older girls were sort of…. well, teenagers and all worried about what there would be to do for them. But you know what…they had fun! 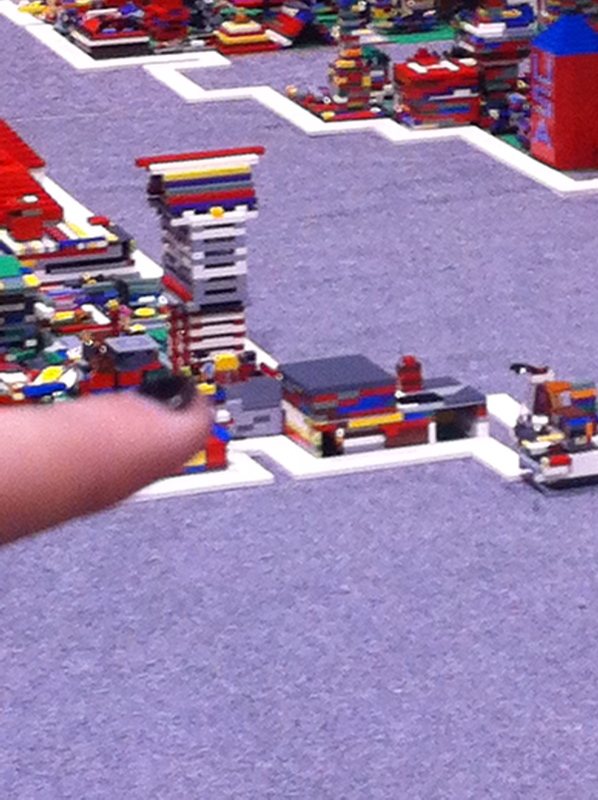 They built things, they saw some awesome displays, and took some interesting pictures. 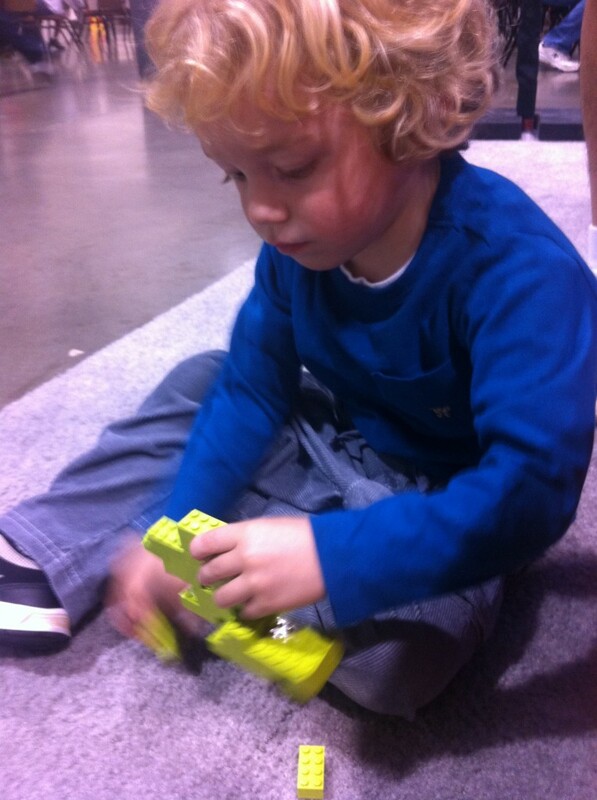 The younger kids had a great time too.. they had a huge section of Duplo blocks and that area was full of little kids having a great time. Of course you can buy Legos there too… we skipped that because I just didn’t have the $400 to spend on the Death Star that the girls wanted. How did you spend your weekend? 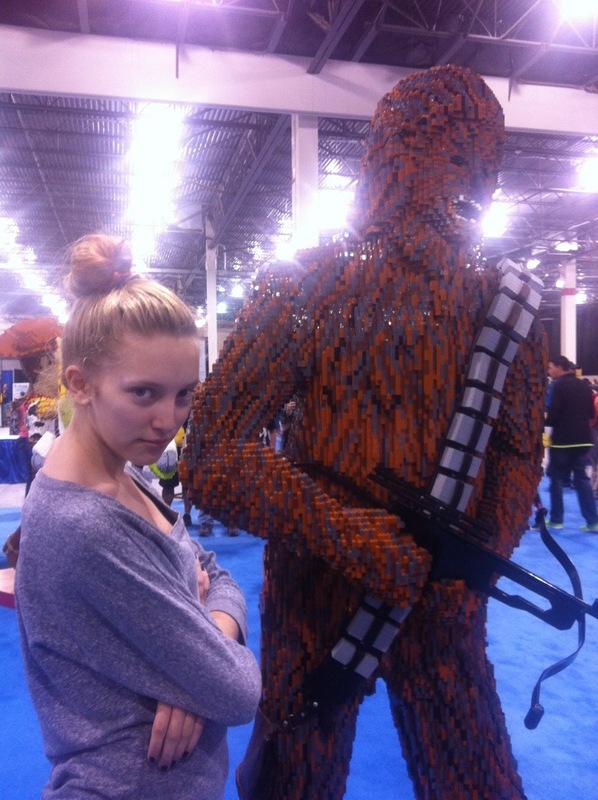 Did you go to Lego KidsFest? Hey.. it’s Wordful Wednesday and I’m linking up with Seven Clown Circus and Parenting by Dummies. 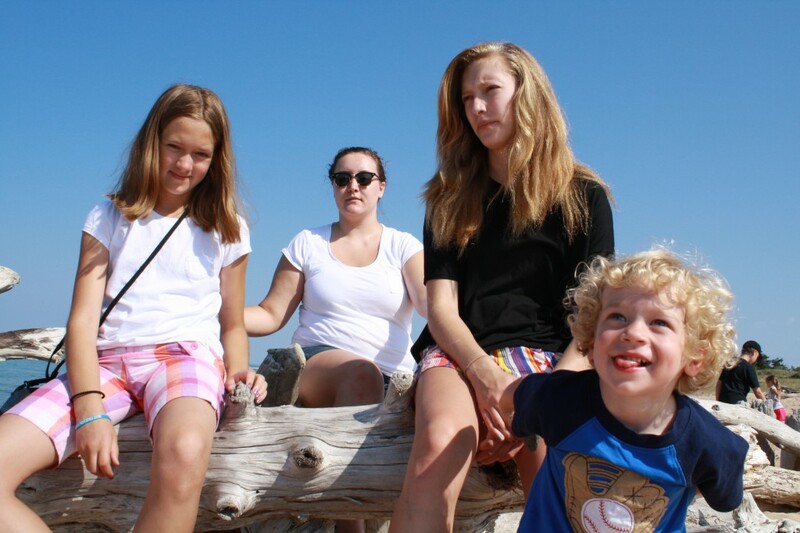 Every summer (or anytime we go some place) I take my camera and this year was no exception, but for some reason the few times I did pull it out I couldn’t seem to get a good picture of my kids. No matter how hard I tried…. fail. For some reason they just weren’t cooperative! Take this one for example. I have at least four or five of them here…. While we were on vacation I thought why not get a great picture of all the kids! 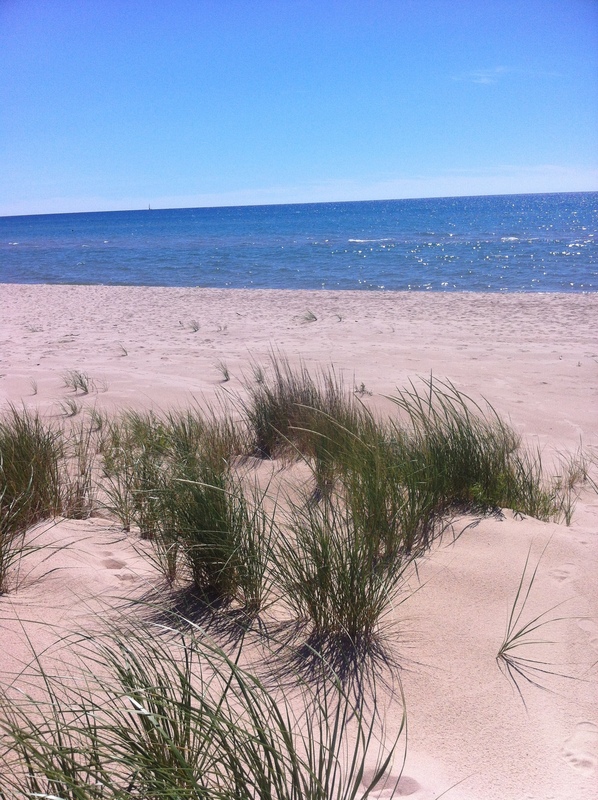 And the location could not have been better… we were on the beach at Whitefish Point in the UP. The beach is beautiful with soft white sand, sun bleached drift wood and gorgeous blue water. Sounds perfect right? Getting them all to sit right, look towards the camera, and smile all that the same time was a bigger challenge then I thought that it would be. Long story short… I didn’t get a picture. 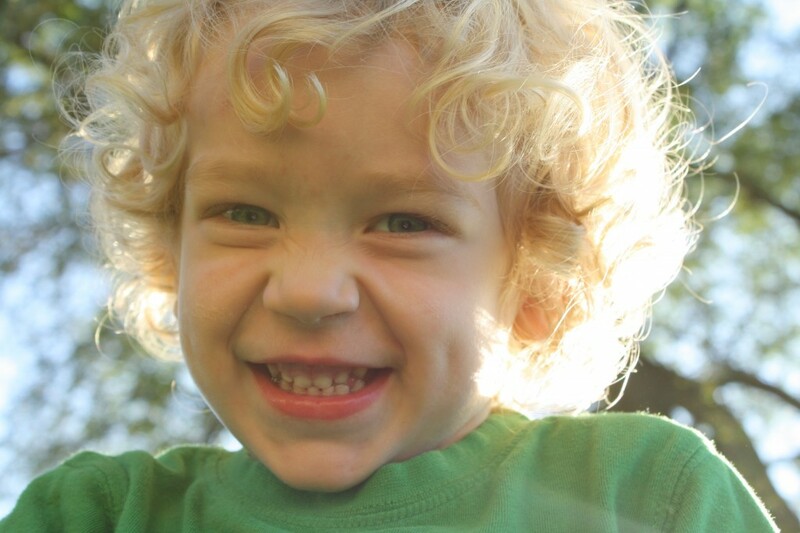 Toddlers can be so much fun and at the same time they can be the biggest pain in the rear that you’ve ever known. Of course any of you with kids already know this. He is kinda cute even though sitting still for me was a lesson in futility last week. Now this picture is one of those very, very rare pictures. 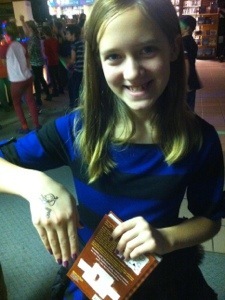 You see that is my oldest daughter and getting a good picture of her is next to impossible. A couple weekends ago we went to the park together with the toddler to play and burn off a little bit of energy. Anyway, I brought the camera with me and was able to get a picture of her playing and smiling. It’s not the perfect picture but she looks happy and is having fun and to me that’s priceless. Now this little gem listened to everything I said, smiled, sat still, and posed so perfectly for this picture and one more. I couldn’t have been happier! 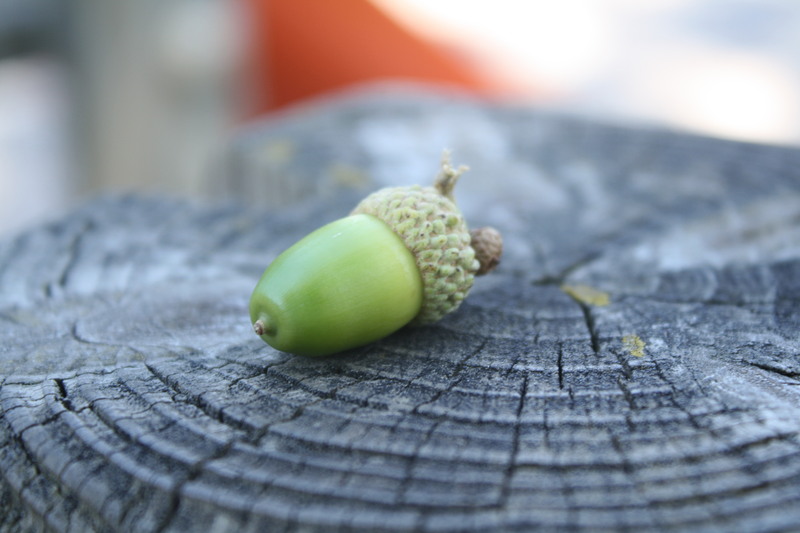 Yea… I know it’s just an acorn. 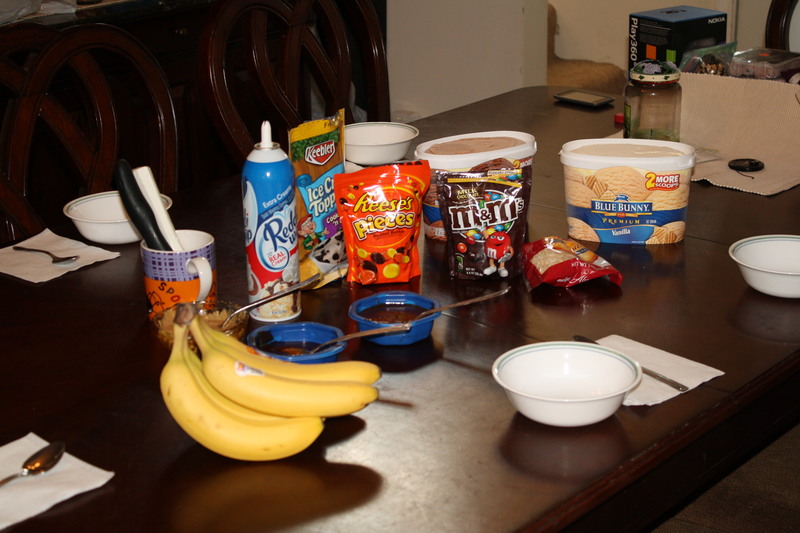 As summer winds down and the kids get ready to head back to school I thought what better way to celebrate then by doing something a little fun and having ice cream sundae’s for dinner one night. It goes without saying that they all loved it! Now, I did make a macaroni salad with tuna just in case they got hungry later and wanted something more than ice cream again. Do you struggle getting a good picture of your kids? Have you tried ice cream for dinner yet? Of course since it’s Wordful Wednesday I’m linking up with Seven Clown Circus and Parenting by Dummies! 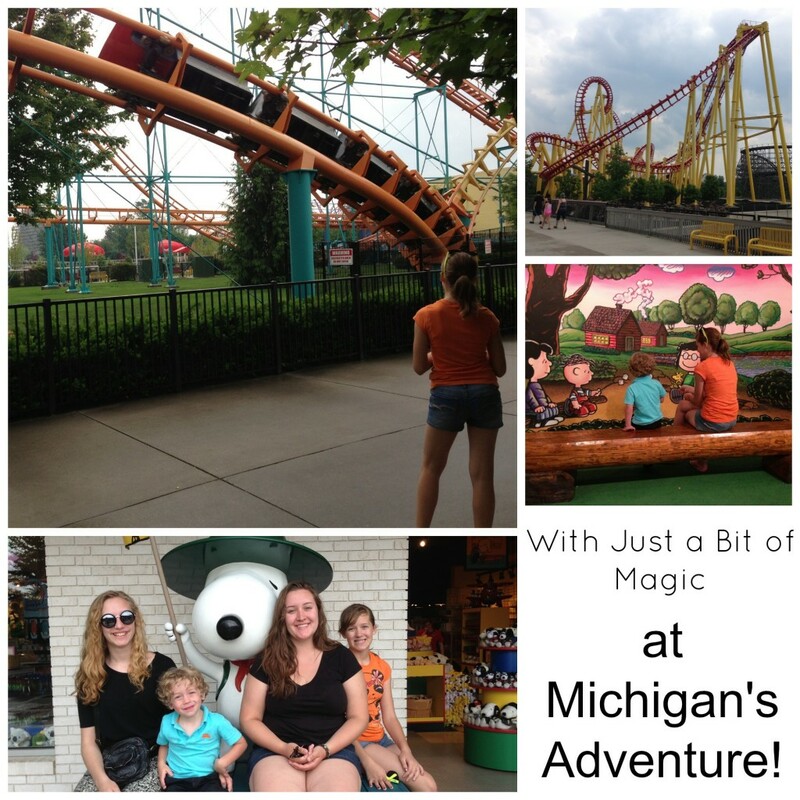 This summer we have spent plenty of time checking out different places around the great state of Michigan… you know, playing tourist in our own state. I’ll admit that I haven’t seen all that there is around here and am glad that this summer we’ve had the opportunity to hit the road! 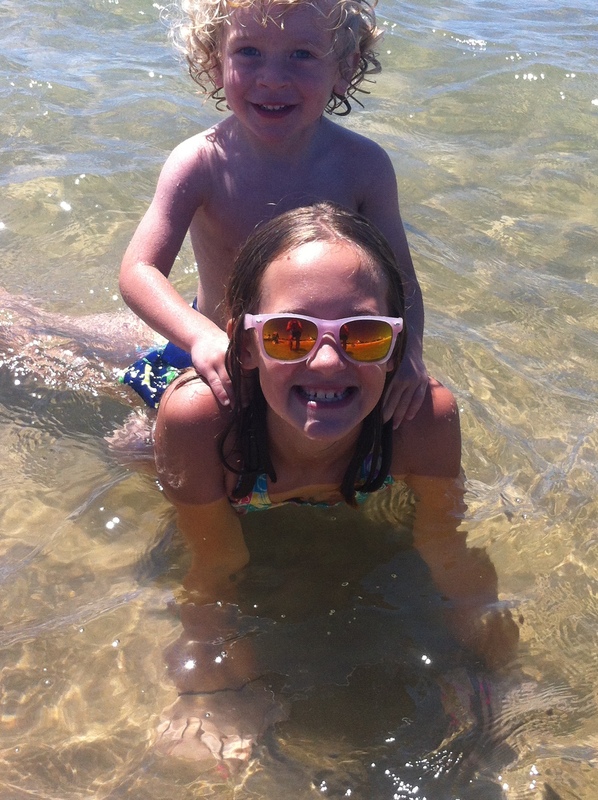 A couple weekends ago we took a day trip to Ludington, which by the way is NOT a day trip! It’s just over 3 hours one way and after spending an entire day on the beach with 5 kids driving home is the last thing you want to do. So take my advice… book a hotel! Ludington is on the west side of the state and is one of many towns that is right on the shores of Lake Michigan. I love it over on the west side…. it is beautiful! Soft sandy beaches, endless sand dunes, and of course the crystal clear blue water that awaits you. Yes, the water is a little chilly but when it’s 90 degrees out the water feels perfect! Can you tell from Lauren’s body language that the water was a little cool when she first got in? Andrew didn’t mind though! 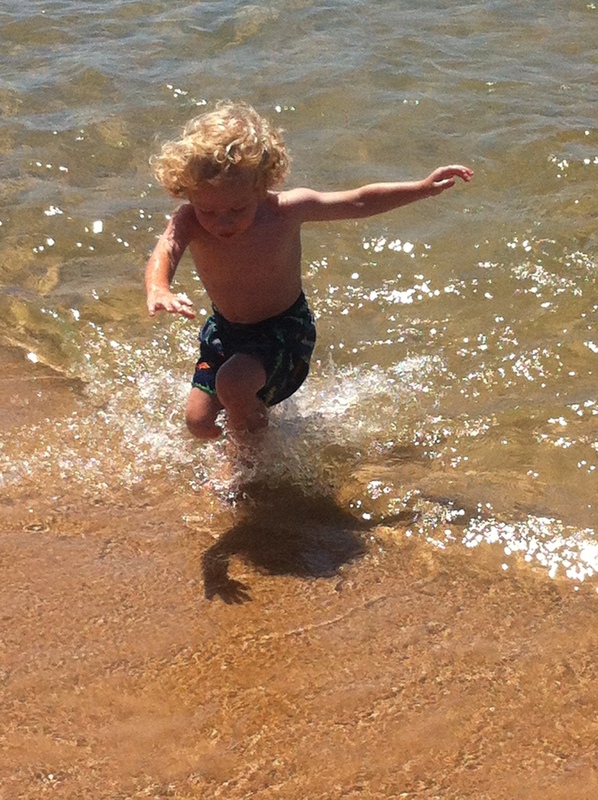 He rushed right in to play in the waves and splash about and then run out and do it all over again! This picture is one of my favorites from the day. As a matter of fact I have 3 or 4 versions of this picture … because it took that many tries before I was able to actually get both of them looking at me. 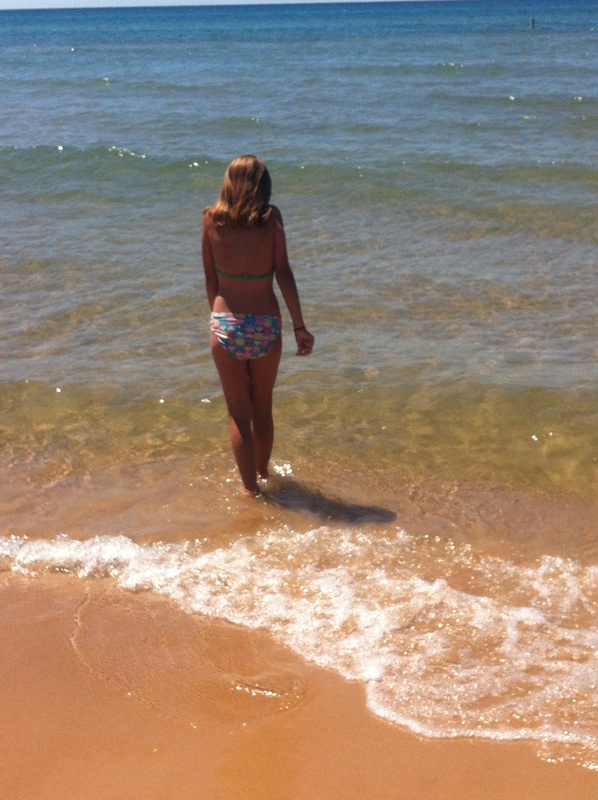 There it is… the shores of Lake Michigan. I think that the picture speaks for its self. So are you wondering where pictures of the other 3 are? Well they’re teens… and getting a picture of them without them glaring at me is almost impossible. Anyway, I have a couple pictures of them but I didn’t dare post them for fear of what would happen if I did. They weren’t the most… becoming pictures. Do you play tourist in your own state? What are your favorite places to visit? So it’s Wednesday and that means that I’m linking up with Seven Clown Circus and Parenting by Dummies for Wordful Wednesday! Cheese!! That’s what I kept hearing over and over again while Andrew was playing with my phone. I didn’t think much of it because I figured that he wouldn’t know how to work the camera or anything like that. 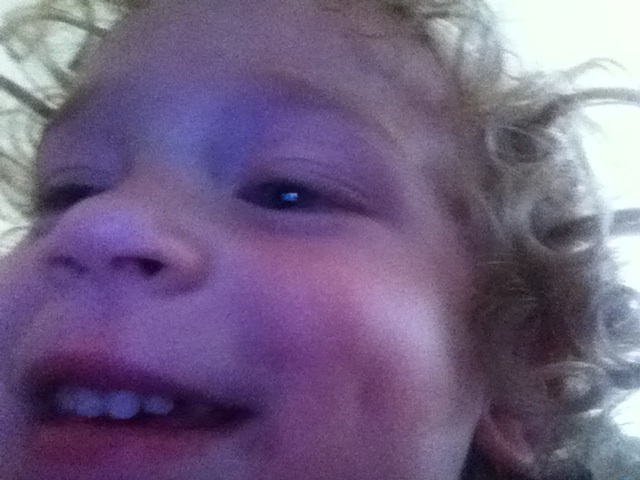 Often he just looks at the phone and says cheese because he knows I use the camera to take pictures. No big deal…. he was just playing. Well, guess what? I was wrong. Yup, you got it…. 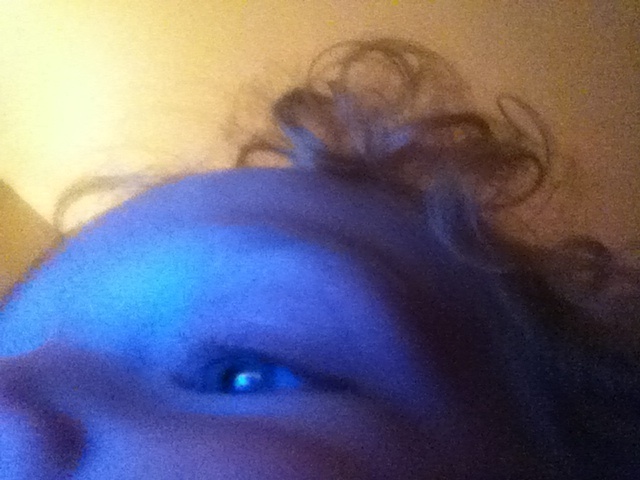 the toddler figured out how to open the camera app and then how to take a picture. When I looked there he was, face so close to the screen that the only pictures taken were of one eye or his forehead, taking picture after picture. From the grainy look of it and the fact that you can see about a quarter of his face you can guess how close he had the camera. But there is a definite smile on his adorable face. Once I figured out what he was doing I had to try and get in on the action. I thought that maybe I’d get one or two cute pictures of the two of us together. 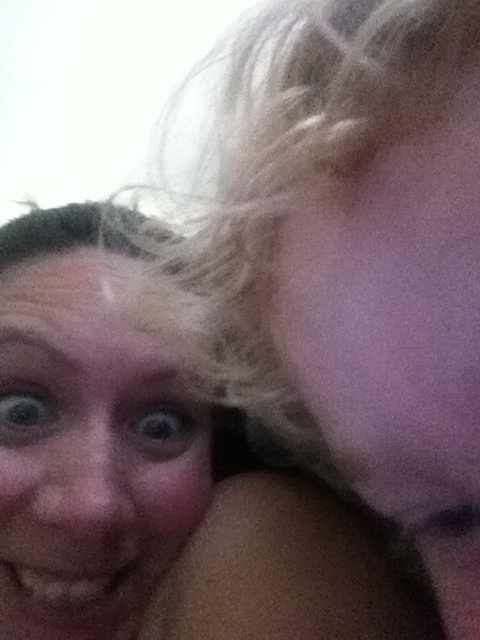 Nope… just a pic of his forehead (again) and me looking like a crazy lady. This one is my favorite and not only because you can see most of his face. What I love about it is how happy he looks, how it captures his pure joy, his fondness for having fun, and of course mischief. This picture captures the pure essence of Andrew. Could there be a better picture? I’ll be honest… I did delete some but I kept a few just because they were cute and halfway decent. Most of all they’re memories that capture mere moments in time that are fun, special, and were a learning moment that made him happy. Tell me…. have you found similar pictures on your phone or camera? Of course it’s Wednesday and that means that I am linking up with Seven Clown Circus and Parenting by Dummies!